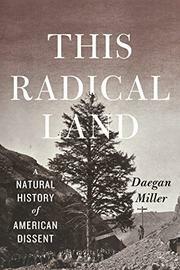 A debut book that ranges across disciplines and decades to connect the natural environment—especially long-lived trees—to a scathing critique of American-style capitalism. Alternating abstract theory with impressive research, both bolstered by extensive sources listed in a near-80-page endnotes section, the author, who has taught at Cornell and the University of Wisconsin, builds his case about understanding American history by examining destruction of the environment through essays grounded in the 19th century. The essays focus on naturalist/writer Henry David Thoreau; photographer A.J. Russell; slavery opponent James McCune Smith; anarchy advocate Burnette Haskell; and even Communist theorist Karl Marx. Miller terms the living trees connecting the land to westward-moving humans “witness trees.” From their spreading branches, the trees witnessed what humans considered “Progress.” As Miller writes, “in this epic whose text was the landscape, the most prominent feature was the continent’s leafy verdure.” Looking back, however, the author considers expansion and the many attendant unacceptable compromises of social justice. At intervals, Miller abandons his negativity by hoping for a better future marked by healthy trees, clean rivers, thriving family farms, humane technological advances, and communities of residents bound together in mutual compassion. In some sections, the author moves away from abstraction to ground the connected essays in specific trees, such as the great elm on the Boston Common or the giant sequoia in California that has been dubbed General Sherman. The essay focusing on Russell is especially poignant regarding trees—their presence and their absence—and how they link to ersatz progress, and many of Russell’s photographs illustrate the pages. Occasionally, Miller turns to the autobiographical, and understanding his adolescence and adulthood aid in comprehending his severe critique of American society in general and capitalism in particular. His real and imagined linkages to Thoreau, for example, provide clues. Following Miller’s complex narrative may tax some general readers. Nonetheless, he offers an eclectic education often marked by soaring prose.